In that short time frame, I was able to create a full line of software that would enable even a severely disabled user to turn on, off or dim any of 256 lights or appliances, with only three one word spoken commands and no special wiring. I was able to develop a hardware module to control a speaker telephone, to allow the paralyzed user to answer and place a telephone call to any place at any time. And, I adapted more than forty entertainment software packages to provide mental rehabilitation, stimulation, and recreation. 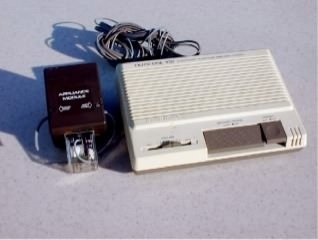 I called this first system, SoftVoice, for Voice Activated Software. Concatenations were really big in the ‘80s. The demo was on! It wasn’t just about creating the first voice-activated system in the world; it was also about the marketing of that product, how it looks, and other logistics. I also had to build an environmental control demonstration unit that would show how a lamp, radio, and ceiling light could be controlled without any special wiring. I built this out of wood, some trim moldings, and some spare carpet and wallpaper I had lying around my garage. Also out of some scrap plywood, I had to build a carrying case to put all of this in. These are the things you never think about. And, Innovators are cheap. We usually don’t have much money, only great ideas and whole lot of “blue sky”. On a brisk morning in mid-February, 1986, I drove the hour and a half from Tri-Cites, Washington to Yakima. Yakima sits in the Yakima Valley in the rain shadow of the Cascade Mountain Range. It’s dry and hot in the summer and dry and cold in the winter. It also produces some of the best wine, grape juice, and apple of anywhere in the world. 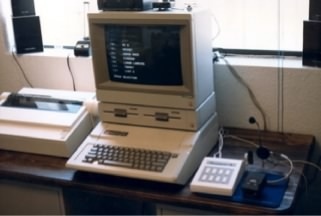 I arrived at St. Elizabeth’s Hospital at around 9:00 AM with my Apple IIe, monitor, and new inventions on my handcart. I was instructed to see Nurse Stump, head of the disability department (I didn’t make this up). We met and she showed me to the hospital room where I’d be demonstrating my new “medical device”. She called it a medical device, cool! I set up and tested the computer to be sure that all was working well. I was the only one in the red zone. Would it work during the demonstration? Would it work for Herb? Would it help him? Could it hurt him? What would he think? Would I make a sale? What if I failed? “Would I look stupid?” I was terrified. Jim Hilschiemer entered the room as excited as a child on Christmas morning. He didn’t know what to expect, but he knew it would be good. And, if it weren’t, it would still be better than anything he’d seen before. I asked Jim why he was so excited about this demonstration. Jim explained that over the last several months, he and Herb had developed somewhat of a friendship. Jim really wanted to save Leon. He explained that the mortality rate with quadriplegics very high. The death rate wasn’t because of complications. If the medical team can save the quad for 24 hours, they stood a pretty good chance of surviving the trauma. The mortality rate is so high in quadriplegia because they want to die. The thought of being confined to a bed or a wheelchair for the rest of their lives, yelling for help for even the simplest of tasks, makes them give up their will to live. They stop eating, refuse medication, therapy, and eventfully kill themselves. This is the only way to do this when you can’t use your hands. Jim did not want to see this happen again with Leon. Leon’s disability was too ironic to just let Herb die. I started the demonstration by pushing Herb up to the computer I had set up on a tray table (the kind that slides over your bed), and placed the microphone headset on his head. I was actually shaking. I explained that we were first going to have to train the system to understand his voice*. Techie Sidebar: There are two types of voice recognition; speaker dependant and speaker independent. The kind you come in contact with most is speaker independent. Every time you use a telephone system or 411 Information and the recorded voice says “Say or press 1”. It records the next series of sounds, creates what is called a sound envelope (it ‘s the shapes of the sound on a graph), and compares that shape to previously stored shapes to find a match. If the system makes a very general shape match, it assumes it has the correct answer and proceeds accordingly. Speaker dependant requires the user to “train” the system for each of the words it will need to recognize. This way the matches are much more accurate. Pros & cons; speaker independent works over a wide audience with different voice pitches, cadence, rhythm, and accents, but is very limited to the words it can recognize. Speaker dependant is much more reliable, but has to be trained by each user’s voice and it won’t work well with a different user. I began training Herb, with Apple, Baby, Deltoid, Egret, on down through to the letter Z and the numbers 0 through 9. Leon was very skeptical and belligerent at first, but with the continuous encouragement of what seemed to now be the entire hospital staff in that one little room, he started to cooperate. I remember he had a problem with the word egret. He had never heard of the tall white herring-like bird, egret. I guess he’d never been to Florida where they are everywhere. Herb asked why I didn’t just use the standard military lexicon; Alpha, Beta, Delta. I told Leon that when I designed this system for him I wanted it to be independent of the military. This was all new area and I wanted a fresh approach. He agreed and our conversation encouraged Leon participate. 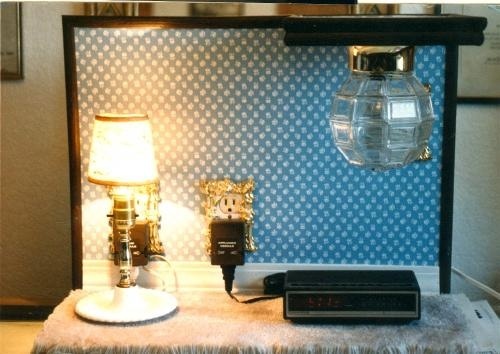 Instantly, the table lamp on the environmental display unit flashed on! Herb jumped up in his wheelchair in surprise. Leon quickly said “two”, and the lamp tuned off! Leon said “one” and the lamp flashed on again! Then everybody including Leon, froze. There was a strange silence that fell over that room for what seemed like eternity. No one moved. No one spoke. When I looked at the room filled with people, they were all staring at Herb. They were all staring in surprise. Staring in disbelief. And, staring to see what Leon’s reaction would be. When I looked at Herb, I could see that his eyes were getting glassy and he had begun to cry. I felt that I was out there on a limb; not knowing what to do next and the silence scared me. I looked up to the hospital staff for help. When I looked into each of their eyes, they were crying too. There was only one thing left for me to do. That was to cry as well. One of the nurses calmly walked over to Leon and placed her hand on his where he could see it as he would be able to feel her touch. The nurse asked Leon, “So, what do you think?” Herb paused for a great while as if trying to compose himself and select just the right words to respond with. Instantly there was applause and cheers for Herb from everyone in the room and out into the hall. I began to openly sob and had to retreat to the parking lot. I paced between the parked cars until I was able to regain some of my composure. When I returned, Keeler’s Medical Supply quickly announced that they would gladly pay the $3995 I was asking for the system. Herb saw that there was hope. All he needed was hope for just a little independence. This early computer system changed Leon’s life. Latter I found out that it actually saved Leon’s life. And, like so many unplanned events that happen in our own lives, this moment changed my life forever.